So recently I encountered something troubling in the toy aisle. You may remember the recall of NECA's Django Unchained Mego-style figures, aka one of the biggest overreactions in toy history. According to the groups responsible for the recall, the figures weren't offensive because they turned a horrifying chapter in American history into entertainment - the protestors actually stated they enjoyed Quentin Tarantino's film - but rather that the figures were marketed to children as playthings. Not only were the figures recalled from the general market, but eBay actually refused to sell them on the aftermarket (only after several sold for hundreds of dollars, of course). This, despite the fact that these figures weren't marketed to children whatsoever. There are no ads for Django Unchained action figures on Nickelodeon or Cartoon Network. In fact, the packaging specifically notes that the figures were for ages 17 and up. If you weren't old enough to see the movie, you weren't supposed to buy the toys. Additionally, these weren't traditional action figures, they were a throwback to the Mego style quasi-dolls that haven't been popular with anyone outside of nostalgia-loving adults in decades. The entire protest around the Django toys seemed to ignore that there is a sizeable adult collector market in the toy and figure world. Children aren't meant to buy figures from Nightmare on Elm Street or Friday the 13th or Breaking Bad, but these figures exist, and they are designed specifically for adult collectors. 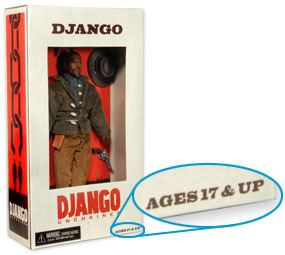 The furor over NECA's Django figs assumes that anything that's a toy must be for kids. This is simply not the case, and hasn't been for many years. Yet the protest was amazingly successful, and now if you want a Broomhilda figure, prepare to drop a couple thousand for her on Amazon. And yet, recently while I was perusing toys at my local Target, I came across something curious. It was in the car and diecast model aisle, which I rarely frequent, but for some reason this day I had some extra time to kill. 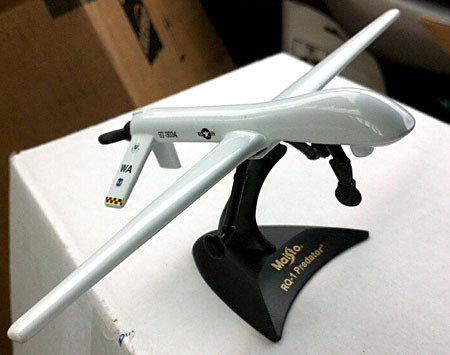 What I found was a diecast model of an RQ-1 Predator drone. If you're unfamiliar with the Predator, it's an unmanned aerial vehicle (UAV) used by the US Air Force and CIA in covert operations in foreign lands, usually to target and kill our enemies. As much as death and war are bad things, there's nothing particularly shocking about toys that glorify war: GI Joes, fighter plane replicas, etc. What's controversial about the drones, however, is that they have been implicated in massive civilian casualties overseas. By some estimates, thousands of civilians have been killed by US UAVs, and according to the Brookings Institute, it seems that for every militant or terrorist killed in a drone strike, 10 civilians meet their end as "collateral damage." So toys of soldiers and warplanes is one thing, but should we really be marketing a model of a vehicle that has a controversial history of killing civilians and children? Oh, by the way, the age recommendation for Maisto's RQ-1 Predator diecast? 3+. Undoubtedly, the only reason it's not lower is due to the choking hazard. That means that these UAV models are specifically being marketed to children who will fly them around and make "pew pew" sounds. Why are so many people outraged over adult collectibles based on a fictional movie that reflect a particular point in American history, but nobody seems to care that a toy version of a real life vehicle responsible for untold innocent deaths is marketed to anyone old enough to know they shouldn't swallow the landing gear? The point of this is not to say we should call for a ban of Maisto's diecast drone models. Rather, I'm just trying to draw attention to the double standard present in this whole hubbub, that it's unconscionable if a kid is somehow exposed to figures clearly intended for adults and based on a fictional film, but it's totally fine to hand your kid a replica of something responsible for murdering innocent children, just like them, in the real world. What I'm saying is, perhaps our priorities are somewhat misplaced. If you're a parent and you're buying your children toys that are clearly marked for people over the age of 17, that's the fault of the parents, not the toymakers. But a toy drone that kills civilians, labeled as suitable for ages 3 and up? Who bears the responsibility for that? You'll have to be rich to afford NECA's Django figures on the secondary market, but if you want a controversial toy, just check out the toy aisle at your local Target. It'll only run you about $3.50.